Your grandparents are too old to take care of the family zoo on their own, so it now falls on you to lend them a hand. There are many people who are looking forward to shutting your family zoo down though… and you simply cannot let that happen! Zoo 2: Animal Park is a zoo simulation game where you get to design and build your very own virtual zoo and fill it up with all of your favorite zoo animals. Repopulate your zoo with a variety of common and exotic animals, set up stalls to sell goods, and decorate the place to attract more visitors. Grow your zoo and turn it into the profitable zoo there is! Like the original game, My Free Zoo, that this game is based on, any animal you want to bring into your zoo will first require an enclosure. There are many types of enclosures, each of them is suitable for a different variety of animals. These enclosures can only house 1 animal species each, though the number of animals (of the same species) it can contain vary depending on the upgrades it has. Please take note that every enclosure - or anything that your visitors can interact with, really – will need to be placed right next to a path that’s connected to the entrance or your visitors will not be able to visit the animals in them. 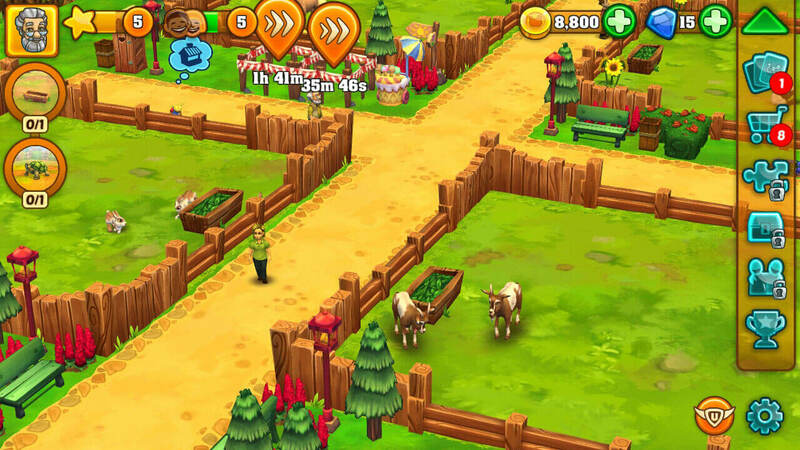 You can also spend some money on buying some useful items such as a trough, which will help feed your animals even when you’re offline, along with beautiful decorations. The enclosures will gradually get dirty over time as well. When this happens, you just need to tap on the Brush icon and start swiping over the muddy animal paw prints on the ground. To match the many variety of enclosures, you will also be able to buying a nice selection of animals. These animals will require a couple of things to be happy – food, hygiene, and some play time. In terms of food, Zoo 2: Animal Parks provides you with 3 choices. There’s the free option which doesn’t give as much experience points (XP). You can also buy food using coins or diamonds, which will grant you more XP per feeding. We’ve already covered enclosure hygiene, so let’s move on to “play time”. Like your real-life pets, you’ll need to spend some time playing with your animals just so you can give them the attention they need. Keeping your animals happy is one thing; keeping your visitors happy is another. Your visitors will need certain facilities like toilets and trash cans, and you’ll need to provide them. Decorations are also important since they beautify the place and improve the mood of your visitors. By the way, everything you buy in this game will slowly fill up the Visitor bar at the top. Once filled, a new visitor will drop by your zoo. Your goal is to get as many visitors as you can since more visitors means more profits; and more profits means that other people like the mayor and the nefarious neighbor will not be able to shut down your family zoo. All the new enclosures, decorations and animals you buy require quite a bit of coins though, and unfortunately, the game only has 3 ways for you to earn coins, albeit at a rather slow rate. The first being collecting your ticket sale earnings from the entrance of your zoo. You can get most of your income here as long as you remember to log in frequently throughout the day. 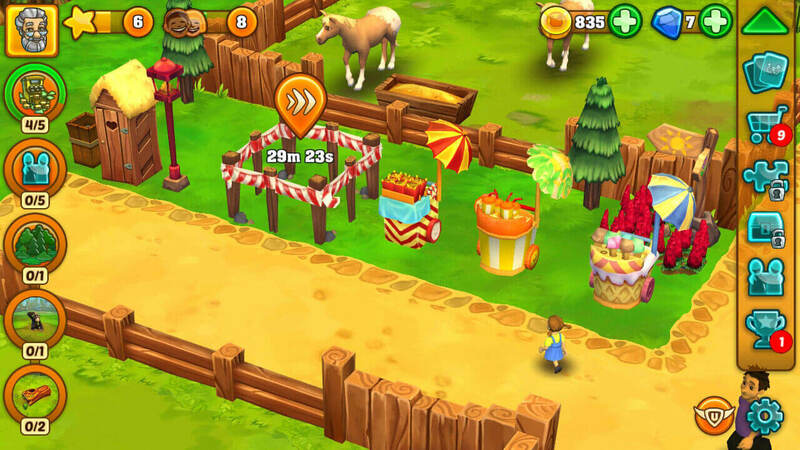 You can also set up various stalls around your zoo to sell your visitors stuff like refreshments, snacks and souvenirs. Like the ticket sales, you will need to periodically collect your earnings because each stall can only hold so much cash. You can even upgrade your stalls to increase your earnings. From time to time, you may complete achievements too, and these completions usually reward you with a ton of coins. However, you don’t really obtain achievements often, so you cannot really rely on getting achievements as a way to earn some cash in this game. Now, if you’re looking to spend some real money just to make the game better for you, then you will want to buy some diamonds. Diamonds are the premium currency of the game and will allow you to not only purchase exclusive premium items, but also lets you speed up construction processes. There are limited-time packages that you can buy as well, which will usually include exotic, and sometimes rare, animals – literal animal magnets to attract more visitors - for your zoo. 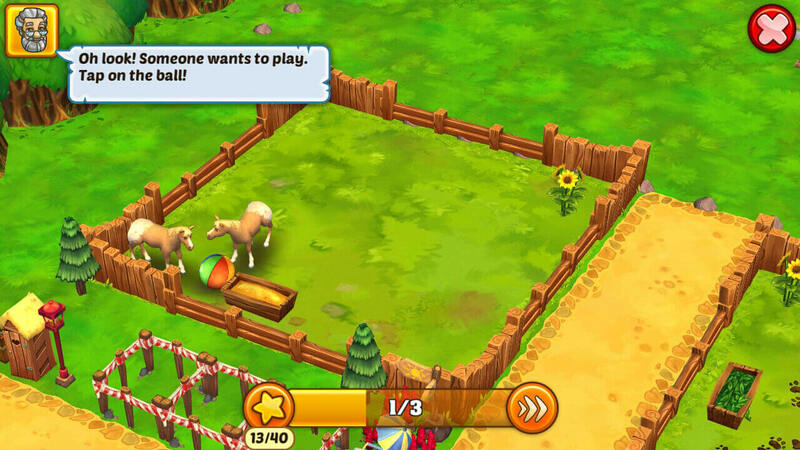 Zoo 2: Animal Park is a very social game, and as such, you are encouraged to add as many friends as you can. In this game, you can help your friends out with some chores and collect hearts in return. When you have enough of these hearts, you can then receive a friendship chest for your efforts. Not to mention, the graphics in Zoo 2: Animal Park are definitely a couple of notches up from the original game it is based on. The 3D models are simply so well-designed, and this is particularly true for the animals. In short, Zoo 2: Animal Park is a gorgeous zoo simulation game that kept all of the amazing features of the original and introduced a couple of tweaks to make the game better. This is really a game worth playing, especially if you’ve enjoyed My Free Zoo before. Download it now for free on either Google Play or the App Store.